We have exciting news from Dior today – one brand new fragrance, and one old favourite that has been reimagined to suit the new look Addict fragrance family. Dior Addict Eau Sensuelle, in its vivid mauve bottle, is a delicate and sensual new floral fragrance that captures a sense of soft sophistication. Dior Addict Eau Fraiche is the new name for Dior Addict 2, and is presented is a saturated pink bottle that is as fun and fruity as the fragrance within. This brand new fragrance has a harmonious signature that captures the voluptuousness of the velvety rose bloom. With touches of freshness and sensuality, it is a scent that expresses a strong personality whilst remaining soft and delicate. An opening of rose essence and rose absolute ensures a rich an enveloping start to the fragrance, before a heart of rose essence radiant jasmine entrance with their sweet freshness. The base note reveals a tender sensuality and a hint of seduction with white musk and cedar notes, both simultaneously full of character, yet mellow. 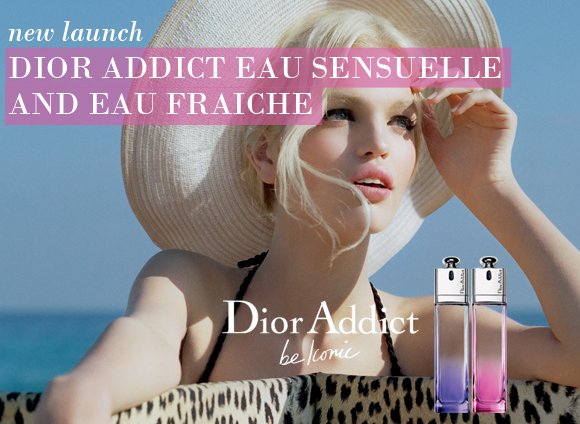 In line with the new-look Addict family, Dior Addict 2 now becomes Dior Addict Eau Fraiche. Where the bottle and name have been subtly reworked, the fragrance inside remains exactly the same with no changes whatsoever. Bright and sharp, yet fresh and woody, Eau Fraiche celebrates the radiant freesia blossom. The opening accords sparkle with bittersweet grapefruit and bergamot, before a complex heart of subtle freesia and white Lotus Blossom meets with the juiciness of pomegranate. This joyous cocktail concludes with a powerful, structured base of woody notes combined with tender white Musk. In line with the new-look Dior Addict family, Dior presents a new film, and a new heroine. The captivating Daphne Groeneveld is the embodies the same sense of fun, provocation and beauty as the Addict fragrances, and charms her audience under the direction of filmmaker Jonas Akerlund, and photographer Tim Walker. Discover the eccentric charm and magical seduction of Daphne in St Tropez in the video below – we love it! 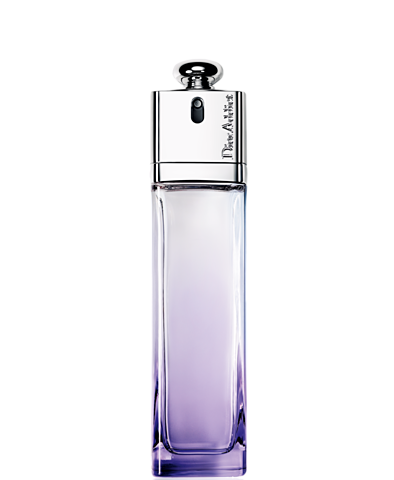 If you maybe imagine that Addict eau Sensuelle will be sensual and maybe stronger version of original Addict, well you got it wrong. They don't have any similarity, only the same shape of bottle and box. 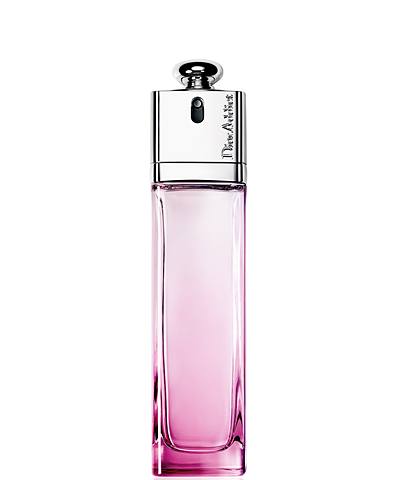 This perfume is lighter, spring - summer and flowery version of first Addict. I presume this one was imagined for warmer weather, and original is for cold one. Addict eau Sensuelle says in description that it is based on rose, but unfortunately I don't smell any rose I just smell jasmine, bitterly, sour and little freshly jasmine. This perfume is great for warmer weather, and with one spritz it last for 6 hours on my hand. I think that is great wearability consider this is lighter perfume. Addict eau Sensuelle isn't just another summer watery perfume, he is far from that, if you're looking summer flowery perfume like Chanel Chance eau Tendre, Marc Jacobs - Daisy Hot Pink Edition, Bvlgari - Omnia Coral, Lancome - Tresor in Love ... than Addict eau Sensuelle isn't perfume for you, because of his bitterness and freshness, it is opposite of classic summery pink flowery scents, but it is definitely worth trying! This entry was posted on Wednesday, June 27th, 2012 at 9:00 am and is filed under Fragrance, New products. You can follow any responses to this entry through the RSS 2.0 feed. You can skip to the end and leave a response. Pinging is currently not allowed. There is no definitely change to the scent, just to the bottle and the packaging. It’s still the same beautiful fragrance, but is more in keeping with the revamped Addict look.